Chatto & Windus, 1963, Hardback in Dust Wrapper. Condition: Good — in Good Dust Wrapper. Dust wrapper faded and tanned at the margins, sealed mylar, with loss at the foot of the spine. Previous owners' inscription to the first blank with a book plate to the pastedown. Edges of the text block lightly spotted. Top edge of the text heavily tanned. Text complete, clean and tight but a little age-tanned and musty. Signed by the author on the first blank— unverified and reflected as such in the lack of premium and includes two typed poems with corrections entitled ‘The Experiment’ and ‘Philoctetes’. 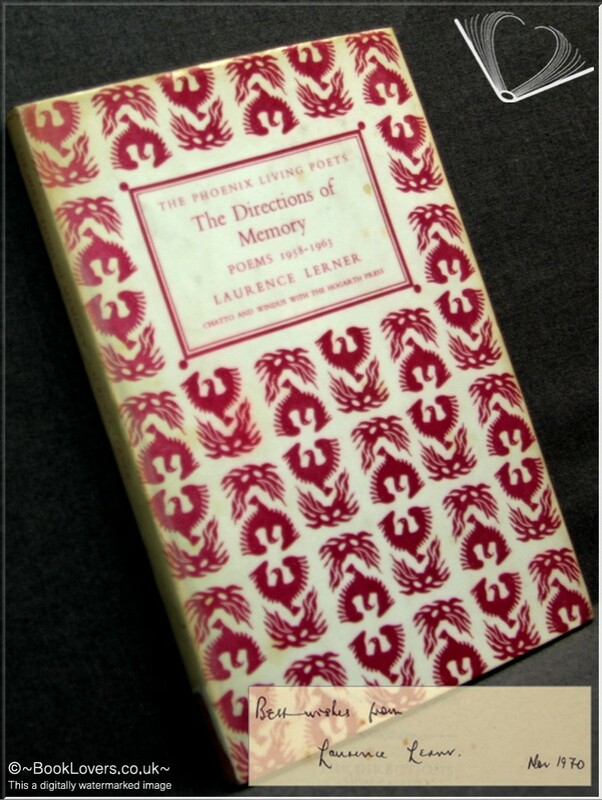 From the cover: “The poems in The Directions of Memory are about a wide range of subjects, but linked by common themes. Those in the first section, ‘The Anatomy of Love’, are about men and women, and the tangle of feelings that holds them together — or apart: they confront the fact of solitude, and the happiness and limitations of love, often from the women’s point of view. Then follows a section in which the poet ranges more widely to find his persona, speaking as an Irish saint of the fifth century, a child in a totalitarian country, a wife dreaming herself into the story of Judith and Holofernes — or more openly as a part of his own self. Finally comes a group of poems which make more explicit the theme that underlies the whole book: the passing of time, the constant traffic, in fact and memory, between past and present. Jacket designed by Enid Mars. Size: 8¾" x 5¾". Red boards with Gilt titling to the Spine. In the Phoenix Living Poets series. 71 pages.